I am reminded of Thanksgivings long ago, when I was a boy. I couldn’t wait to go to my gramma and grampa’s house. It was a wonderful place with animals, great food, big draft horses and my grandparents lived there! Oh how I loved that place. It seemed every year, back then, it was cold and snowy. The wood fire heated the house while gramma’s great cooking filled our bellies. Once the meal was finished, grampa would have to go do chores. I begged to go along. Every once in a while, I was allowed to go, it was awesome! I have many great memories of my grampa Rice. Almost every one of those memories involve horses or some other farm animal and of course, making maple syrup. I do miss him so very much. Today, it dawned on me, that I am grampa Rice. I saw magic in the eyes of my grandchildren today. It was heart-warming as I saw memories dance in the eyes of the little ones. Our great grand children were here today too, out newest, a baby girl, rode in the sled while sucking a bottle. I doubt that she will remember today, but I vow to be her grampa Rice as long as I live … and even long after, in her memory. We hitched three horses just for fun. The bells echoed across the farm as the harness bells chimed. The snow made everything clean and the sun blessed our day, shining brightly, in the afternoon sky. The little boys held the ends of the reins and had a big time. The youngsters were not the only ones with magic in their eyes for I too had a certain shine in mine. 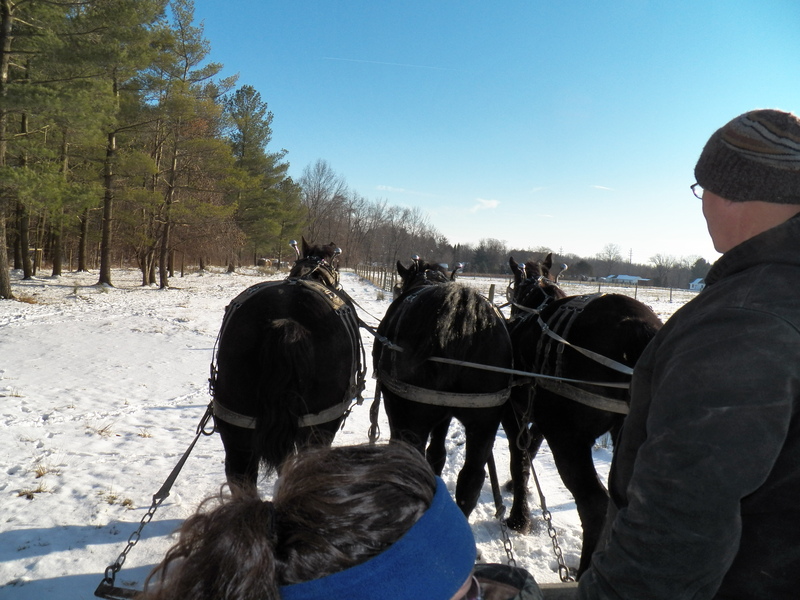 I spoke to the horses and guided them around our farm and I could feel my grampa, my great grampa and my dad riding along with us. We made magic and we made memories and I am real sure that my grampa Rice would be proud! The harvest is complete. 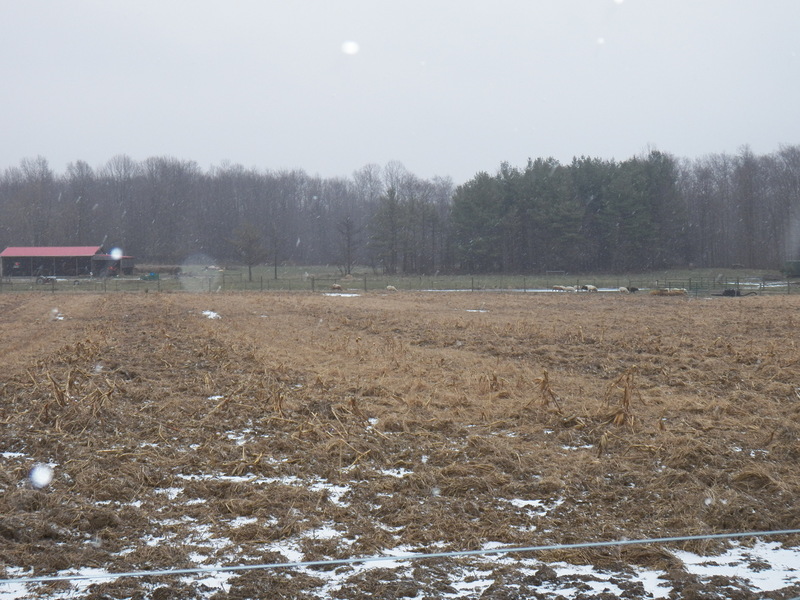 The cows and sows have gleaned the corn off this field. The field now rests until spring. We celebrate Thanksgiving enjoying the fruits of our labor. A meal shared by family and friends is a great way to celebrate the harvest! On this farm, we think outside of the box. I try to keep my options open and my ideas fresh. I am wise enough to not reinvent the wheel, but rather, search out the old methods of farming and use them for my own good. Using animals to harvest crops, especially corn, has been done for decades. I used it this year due to the pitiful crop that grew in spite of the weather and weed pressure. The animals fed themselves for six weeks. They will spend winter on this field to deposit their manure, eat a little more fodder and get excercise. The sows will share in this field once their babies are weaned. They will root around in the soil with the boar. Breeding will take place and the cycle will repeat itself. Spring will come and the field will be pushed into service, gestating sows will pasture in a different field and next year’s crop will grow. The horses enjoyed a day just romping and playing. The ground was frozen. They made no tracks with their big hooves. It seemed they could tell a storm was coming, but they had several hours of pure fun in spite of it. I would also like to take a minute to say thanks to the folks who will be at work that day. Men and women like police and firemen. The people who keep the stores open and even the parades happening. I salute those folks… Take a minute as you say “thanks” to remember the men and women in service to our country and the doctors and nurses who give care. I will say thanks as well to the folks whose jobs require them to work through holidays, weekends and stormy nights. Men who run the trains, factory workers and airline pilots are but a few who will toil as others spend time in celebration of Thanksgiving …. but every one of them is just as thankful as the rest of us. Enjoy a meal, treasure your time off from work and if you get one …. enjoy that short week! At this time of the year, lots of folks are counting down the days. Some are counting down to the end of the year. Youngsters are counting down the remaining days until Christmas. 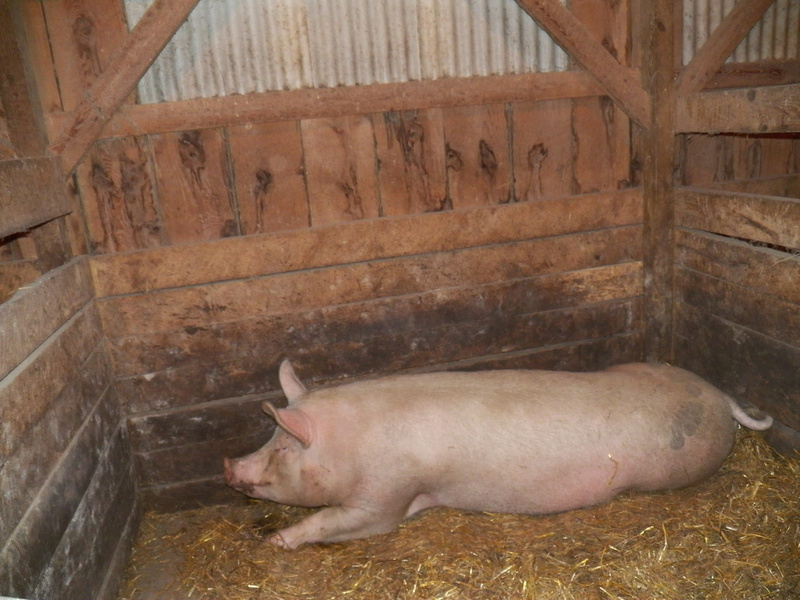 Around here, we are counting down the days until the baby pigs come. The cold weather makes this job a little tricky, but our moms are experienced. They will have no problem managing their babies. They will build big, soft, deep nests. The nests will cradle the babies and along with mom’s body heat, will keep them warm. In any case, the time of year for counting days is upon us. Especially here at the farm… I’m doing all that I can to make sure there is indeed “room at the Inn”. “The storm is coming”, the weatherman says. I think he is right this time. My animals are eating and getting into big fluffy beds. They are all cuddled up and ready for whatever comes. I think that is a great idea. Snuggling while the wind blows outside is a wonderful thing. These girls will all have babies before the end of the year. Now, they are content to lay together and just stay warm. Soon, they will get ornery and want to be alone. That is when they get moved to a place of their own. They arrange their new pen to suit themselves. They push the hay and straw into a big pile and sleep in the center. After a short while, their bed resembles a big bird’s nest. In a day or so after that, piglets will be born. It is a neat sight to see. My next effort stands at the ready! Today was a cold rainy day. We still managed to finish filling the sugarwood kindling rack. So another job is completed. I also washed and put away the baler. 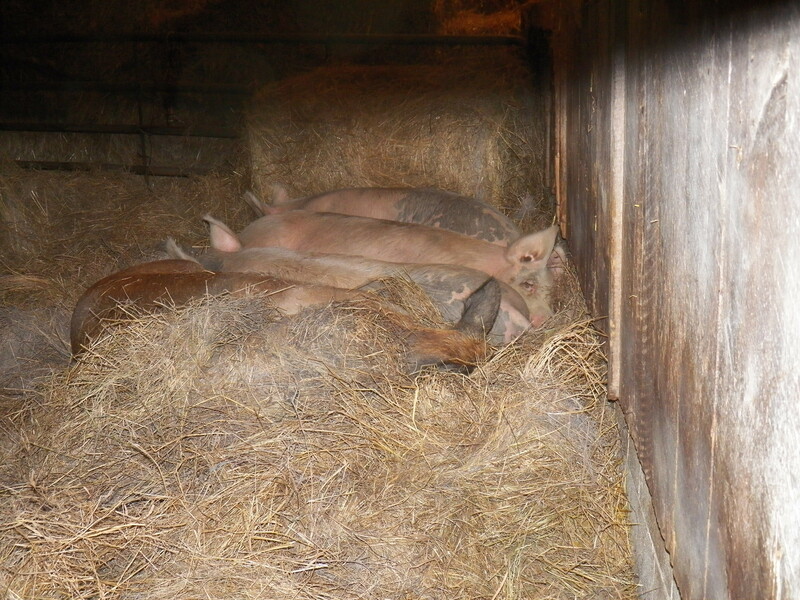 The barns all got cleaned and the sows are snug and warm tucked away under the barn’s overhang. I am very happy with my progress these last few days. I am caught up with all of my work after a very trying farming year. Now, just winter stuff remains. Sure, I want to haul a few loads of slabwood to the sugarhouse, but that just makes for a fun day of horse work. We have our fall butchering to do, but we are right on schedule with that too. I am thinking that I will get a few loads of composted manure hauled out. If the weather completely tanks, I don’t care. I have enough room to pile manure for quite a while. Last night I spent a time visiting with some old friends. The ice cream went down smooth and the jokes and laughter filled a room. It was a nice time. I didn’t stress once about goofing off when so much work remains….that’s because no work remains! Dang I am happy about that! So, as long as the rain stops and the snow doesn’t get too deep, we will be in the manure business. I don’t want any run-off from the manure though, so this project may be put on hold unless we just take it out to the field and run it off into a pile. The pile can be spread later when conditions are right. 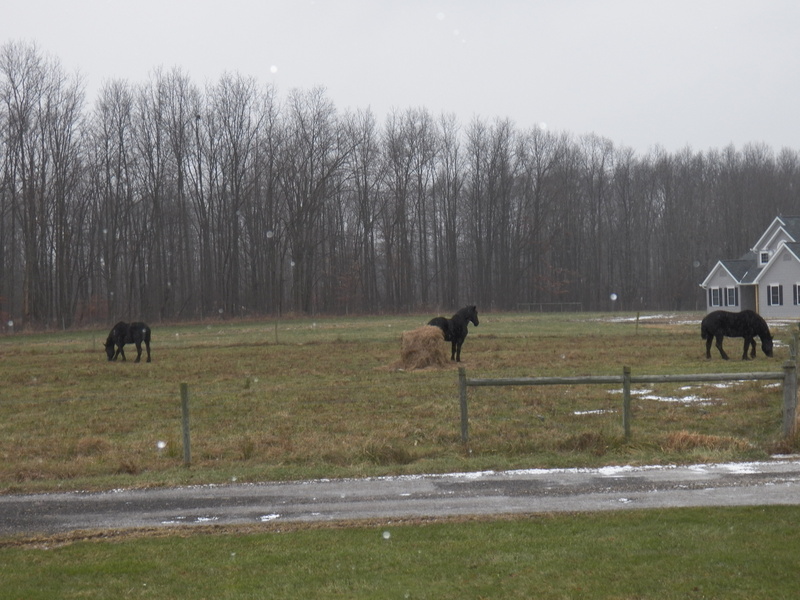 I still make room in my compost stack area, the horses get work, so everyone is happy…especially me. Baling hay with our coats on! 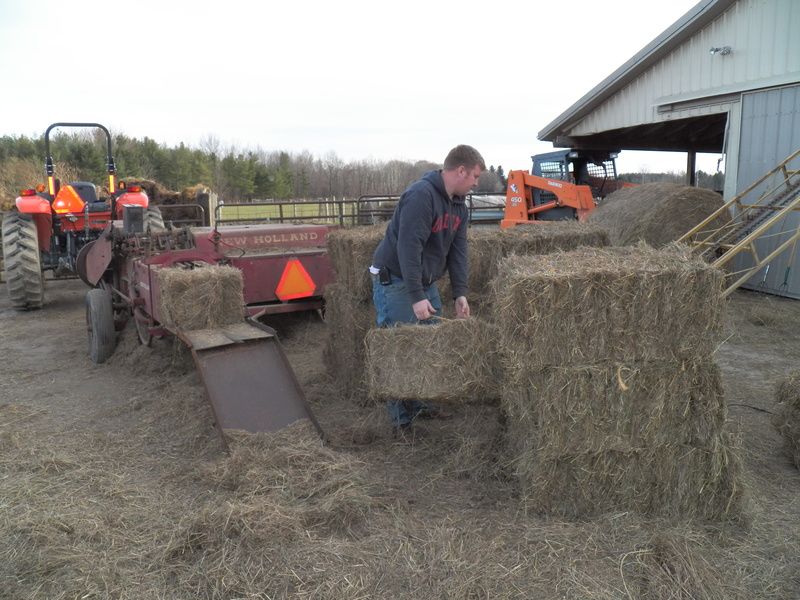 Today, the weather cooperated, and we baled up some of our round bales into small squares. The little bales are very nice when a winter storm is blasting away outside. I just have to climb the ladder to the hay mow to serve the horses their supper. This too is a job usually done long before now. I thought it was funny that we were baling hay with our coats on. Usually sweat runs into our eyes and heat makes it hard to breath, but that was not the case today! We also got half of the sugarwood kindling cut and stacked away. I put some back every year to use to start the fire in the maple syrup arch. It is small slab pieces called edgings. The edgings come off the edge of the log and have very little value. They make great fire starters and real good heat for a quick fire in a small stove, but that is about it. 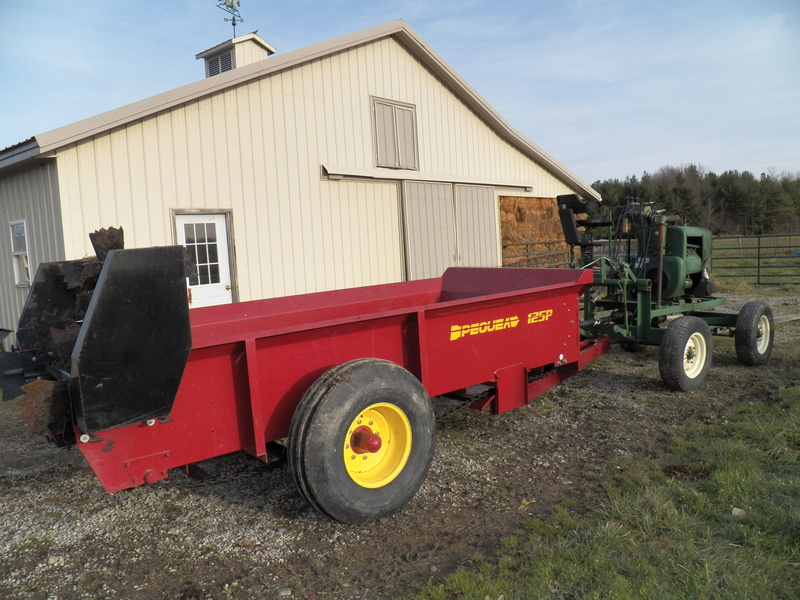 Tomorrow I will put away the baler for the year. It will get a bath, a good oiling and greasing, then stowed and covered up. Again, it’s hard to believe that I am doing this in November and not September, but what a great feeling to be caught up ….almost!